The test setup was a single Access Point – 16’ (5m) away from the test location with a single wall in between. The software was Ekahau ESS 8.7 with the NIC’s all set to track ONLY channel 11 – with data calculated at 105ms interval. This setup allowed for a very fast and consistent capturing of data. This technique allowed for approximately 2,000 pieces of RSSI data over a 2-minute capture. Dwell time was 105ms – with a probe request being sent, and at least one probe response and a beacon per dwell time. This was repeated over and over on the target AP’s frequency. The software package was not designed with this test in mind. But I would have appreciated seeing Max, Min, Mean and Standard Deviation results from each of these tests as well to give a more standardized analysis of each NIC’s possible differences. To see if exact location mattered in compensation testing of Proxim 8494 NIC’s I first did a test with three NIC’s each plugged into a different USB hub port. Thus, each were spaced 2” (5cm) apart from each other. Three Proxim 8494 NIC’s – each 2” (5cm) apart from each other in a USB Hub. Note, it seems like A is about 5dB lower than B and C.
Suspecting exact location would make a difference, I set up a jig to hold the USB hub in an exact position. But when we compare these same three NIC’s in the exact same position… you can see quite a difference in results. Results of tests across 15 Proxim 8494 NICs mounted in a jig for exact location. Exact location matters. Fairly decent differences between NICs based solely on being 2” apart. The worst results changed when we moved the same NIC to a different location. But… location differences did NOT account for everything. There is still a wide discrepancy between like NIC’s in the EXACT same position relative to the Test AP. 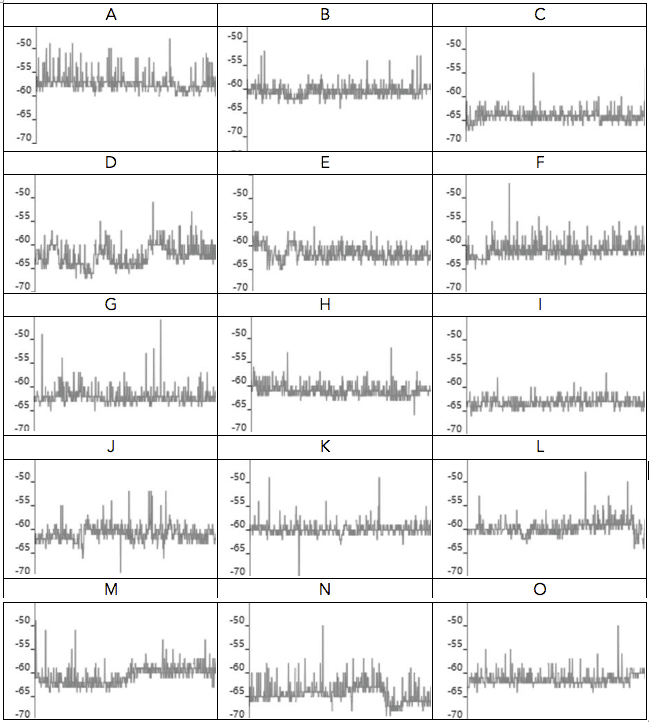 Not to mention inconsistent variability within each NIC’s RSSI calculations. Perhaps a larger, more comprehensive test with Max, Min, Average and Standard Deviation numbers for different types of Wi-Fi devices is in order. This preliminary data shows even within same type device, in the EXACT position there is still a wide discrepancy. If someone was going to ‘compensate’ for different devices, the actual choice of test subject NIC matters greatly. Do you consistently put in the same NIC in position 1, 2, and 3 when you are doing validation surveys?